One of my absolute favourite lipstick shades to wear, is purple. When going through my MAC lipstick collection, I was surprised by just how many purples I own, all of which are different in their own right and absolutely beautiful to wear, purples are the shades I gravitate towards when browsing the beauty aisles. For me, few brands do purple as well as MAC, and after sharing my MAC nudes and MAC oranges, I couldn't resist sharing my beloved purples. MAC Violetta (£15) is one of the few MAC Pro shades in my collection, which was entirely spurred on by Zoe (Zoe London) after seeing how beautiful the shade was on her. Unfortunately, as it's a Pro shade, you can only grab this shade in a Pro store, but if you can get your hands on it? It's a must-buy! Easily my favourite purple from MAC, Violetta has a gorgeous Amplified finish, a truly bright purple with a slight metallic look to it making it one of the more wearable purples in my stash. MAC Rebel (£15) is one of those shades everyone raves about. With a beautiful Satin finish, Rebel is much warmer and brighter in tone than other purples in my stash, it has definite berry undertones and reminds me of crushed blackberries. Rebel gets used most in the colder months, perfect with a touch of gloss, but it's also a purple I think works fantastically well in warmer months, too. MAC Heroine (£15) was originally a limited edition shade which I picked up in the MAC Fashion Sets Collection, but it's now a permanent shade so perfect for anyone who missed out the first time round! With my favourite matte finish, Heroine is deep and sultry, a super warm purple with mauve undertones. MAC Strong Woman is another limited edition shade and matte finish, from the Strength Collection. Unfortunately, not a shade which has been repromoted, so a shade that's no longer available. It's that perfect purple shade, both warm and bright, the only shade in my purple stash which is a true purple, with no hints of other colours or tones. MAC Daddy's Little Girl is (unfortunately) another limited edition shade, from the delightfully packaged Archie's Girls Collection which for me, is easily one of the most gorgeous collections MAC have released. The perfect purple-pink hybrid, Daddy's Little Girl is one of my favourite summer purples. It's light, it's bright, it's eye-catching, and with a lovely Satin finish, it feels super comfortable. MAC Up The Amp (£15) is one of my favourite, favourite lipstick shades, not just from MAC but from any brand! I actually snapped it up in a blog sale for an absolute bargain, but if I were to misplace it, it's a shade I'd happily repurchase at full price. A gorgeous Amplified finish and a shade that's unlike any other I own; a cool toned purple that has a touch of lavender to it. Absolutely beautiful, I cannot get enough of this shade! MAC Flat Out Fabulous (£15) is one of the more recent shades to join my stash and one I picked up purely on hype from other bloggers. That said, it's a shade I've come to really love. More of a pinky purple than others in my stash, with my favourite matte finish, Flat Out Fabulous is exactly that, fabulous! It's bright, but the matte finish tones down that brightness perfectly to make it a super wearable shade. 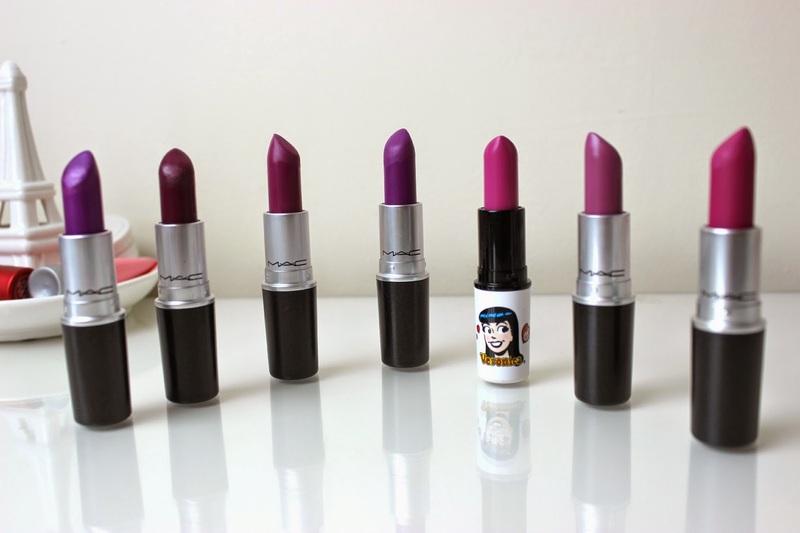 Do you have any purple lipsticks from MAC? 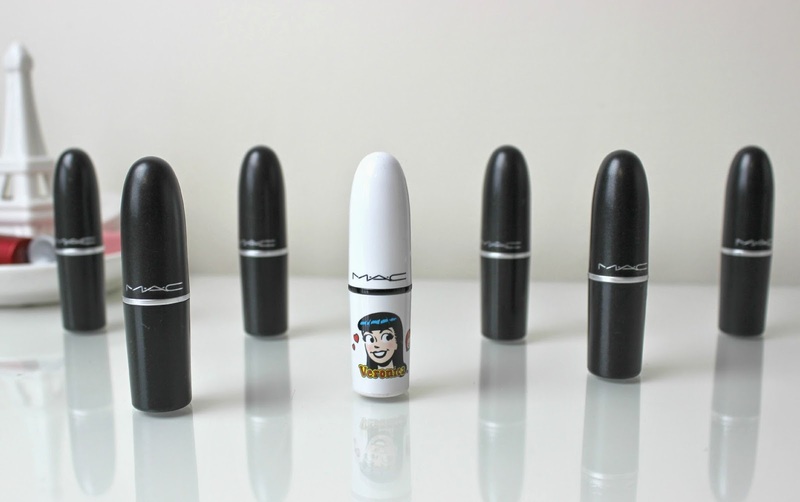 What's your favourite MAC lipstick? I love Mac for the wide range of unique shades like purples. I have Rebel and I like it but I'm to get my hands on Flat Out Fabulous it's gorgeous! I'm the same, I own so many purples! It is a great summer colour! Great post! ooh the one from the Archies girls collection is so gorgeous! Wow, these are such gorgeous colours. I'm not sure whether I could really pull of a purple but I'd love to try rebel! I've recently fallen in love with purple lips. Desperate to try out some Mac colours! I need violetta and at out fabulous in my life - they are gorgeous!! I love Sleek's matte lipstick in mystic, such an awesome purple! Only recently been getting into MAC and I generally have a thing for purples. Would have loved for you to have done arm swatches on these so I could see how they all compare next to each other! Great post! Love purple lipstick!